I have a Sun Crest motorhome with two roof air conditioner units. Many of the sites that we camp at have 30 and 50-amp service. The Sun Crest is wired for 30-amps. When running off of the generator I can run both A/Cs at the same time, but when hooked up to shore power, I can run one or the other but not both. There is a switch mounted under the refrigerator that switches between the two. Is this original? I would like to be able to run both air conditioners when hooked up to the campground shore power. Ideally with one on the 30-amp and the other on the 50-amp. Can you assist me with a diagram? Ronald, there are aftermarket energy management centers available which will allow you to automatically operate both air conditioners, but only one at a time. The device is wired to each A/C and toggles between the two units after each compressor cycles off. Your existing 30-amp service limits the coach to one A/C at a time since each unit requires it's own 20-amp circuit. That's the reason for the "either/or" switch mounted below the refrigerator. 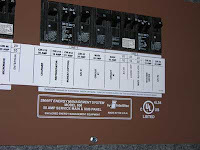 This was the original method of manually switching between the two air conditioners while connected to a 30-amp service. With generator power, the output is such that both units can run simultaneously, (a 6.5 kW generator, for instance, can handle up to about 54-amps). The best alternative in your case is to add the EMS produced by Intellitec, such as the one found on many newer RVs. Connecting a single RV to both a 30-amp and 50-amp service at the same time is not practical plus it does not conform to the RV Codes and Standards, even though aftermarket products exist that purport to do just that. And revamping the whole coach for 50-amp service would not be cost-effective. The installation would not be too difficult since you already have all the wires you need in one place now anyway. Contact Intellitec directly, (800-251-2408), for more information.